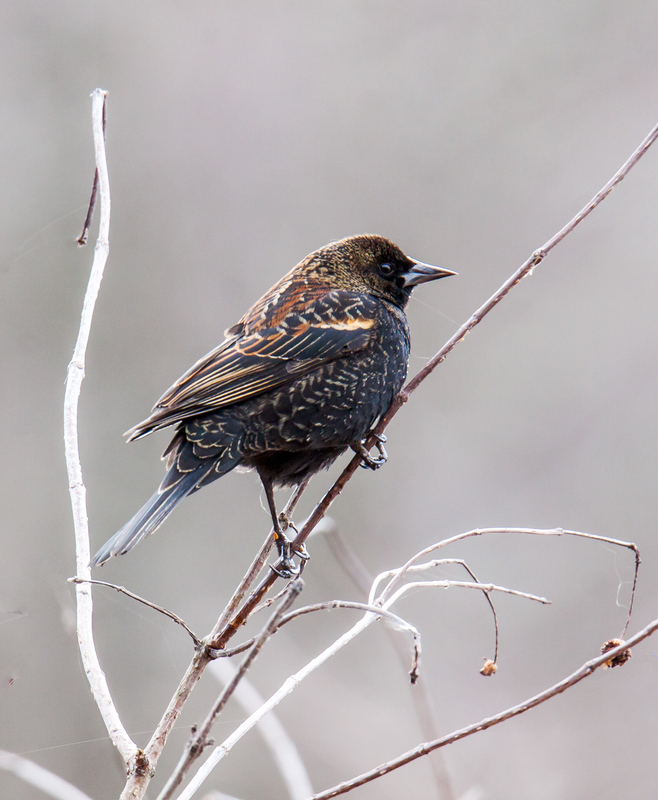 When I took this shot yesterday morning at Huntley Meadows Park, I assumed it was a female Red-winged Blackbird (Agelaius phoeniceus), because of its color and the pattern of the feathers. At home, though, it became clear that it was an image an immature male who is just starting to gain some of the markings of an adult male—you can just make out the beginnings of the colorful shoulder patch. I love the feeling of the early morning, when the world is awash in pale colors and the birds are just starting to wake up. It’s a magical feeling for me sometimes, and the mist in the air last Monday only enhanced that effect. How do you capture a moment like that? I don’t shoot a lot of landscape photos, but I can understand how some photographers are driven to find the right mix of compositional elements to pass on to others the emotional impact of a particular scene. 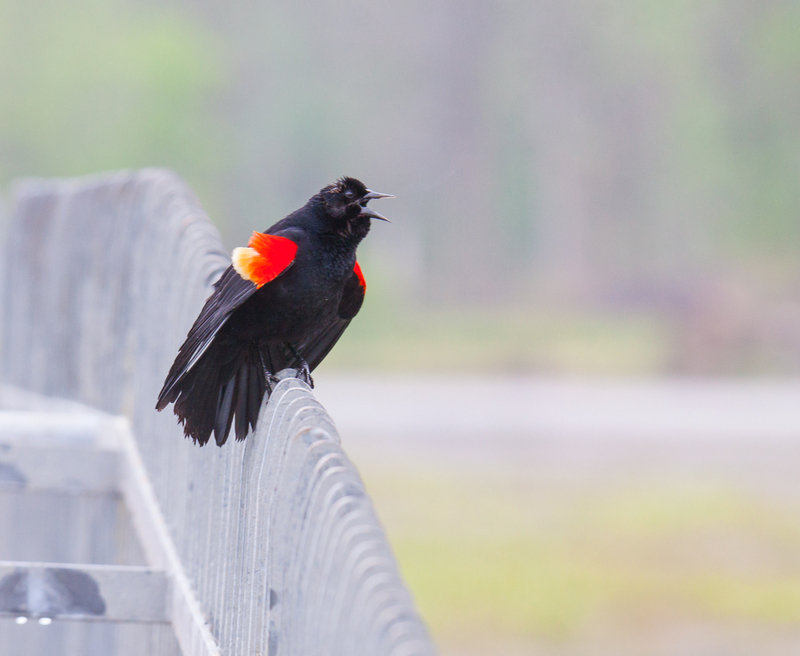 As I was walking along the boardwalk at my favorite marshland park, I was drawn to this male Red-winged Blackbird (Agelaius phoeniceus) perched on a railing leading to an observation platform. Normally I try not to include man-made elements in my wildlife shots, but in this case the railing faded out into an almost indistinct set of lines and shapes. Far in the distance, there is a suggestion of the trees and the water. With its bright shoulder patches, dark color, and sharper details, the blackbird provides an element of contrast with the rest of the scene. 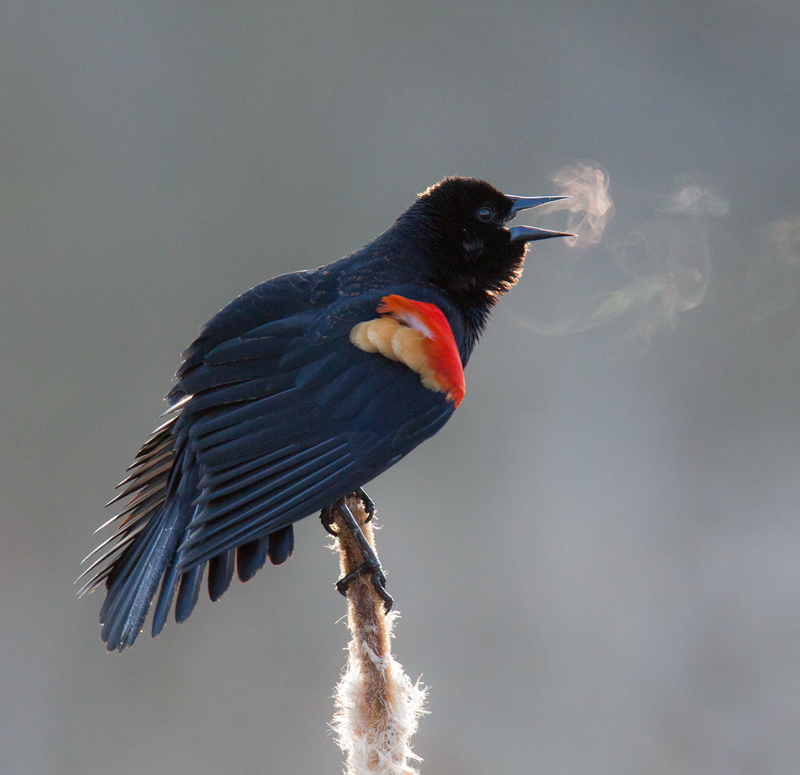 Sometimes it’s fun to chase after more exotic subjects, like the owlet that I saw recently, but at other times I am content to try to capture the feeling of a moment, like this blackbird on a misty morning. 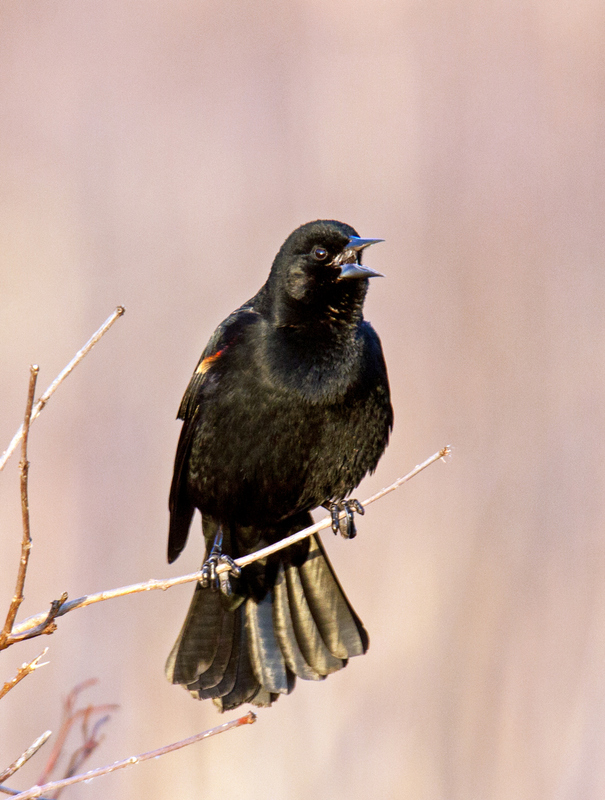 I am not sure why, but this male Red-winged Blackbird (Agelaius phoeniceus) was acting differently this past weekend. Rather than standing tall and singing out loudly, as is normally the case, he was instead hunched over and making a more gentle peeping sound. Was he in pain or distress? Was this simply a different way of communication? It’s overwhelming sometimes to consider how little I know about the behavior of the subjects that I try to photograph, despite the fact that I am learning all of the time. From a photographic perspective, I really like the geometric. almost abstract shape of the blackbird in this image. 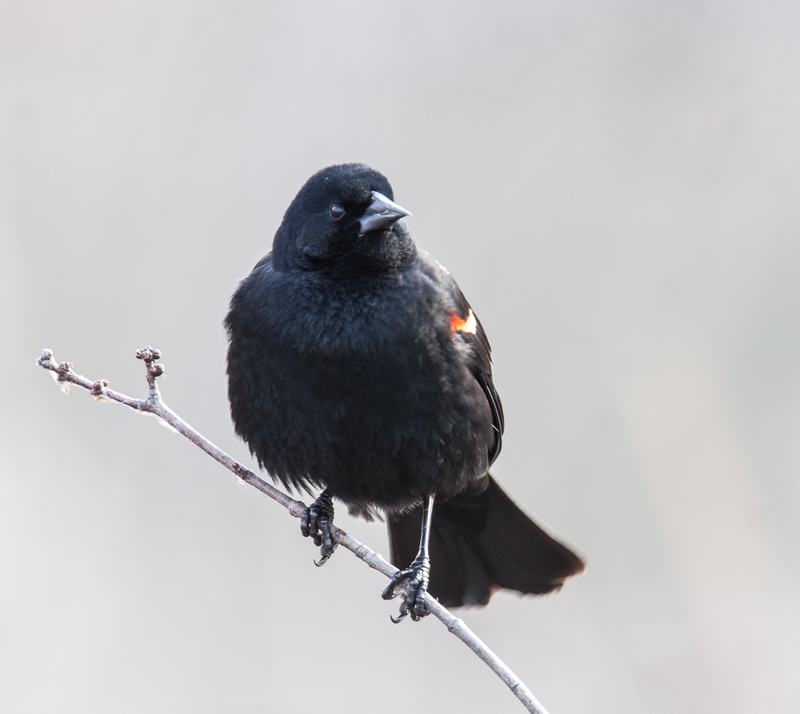 In a field full of cattails, this male Red-winged Blackbird (Agelaius phoeniceus) at Huntley Meadows Park chose to perch on a man-made structure, a weather-monitoring station. I really like the juxtaposition of the natural and industrial elements in the simple composition of this image and its limited palette of colors. 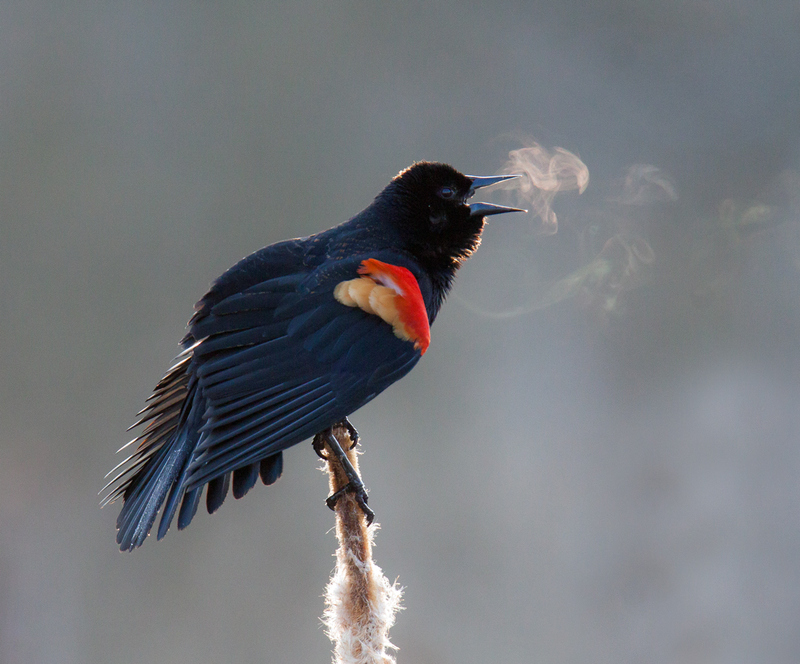 It was so cold yesterday morning at Huntley Meadows Park that the breath of a Red-winged Blackbird (Agelaius phoeniceus) was visible as he sang out from atop a cattail. Spring is definitely in the air and potentially record high temperatures are forecast for later in the week. However, it was right about at the freezing level when I arrived at the local marshland park where I spent so much of my free time wandering with my camera in hand. 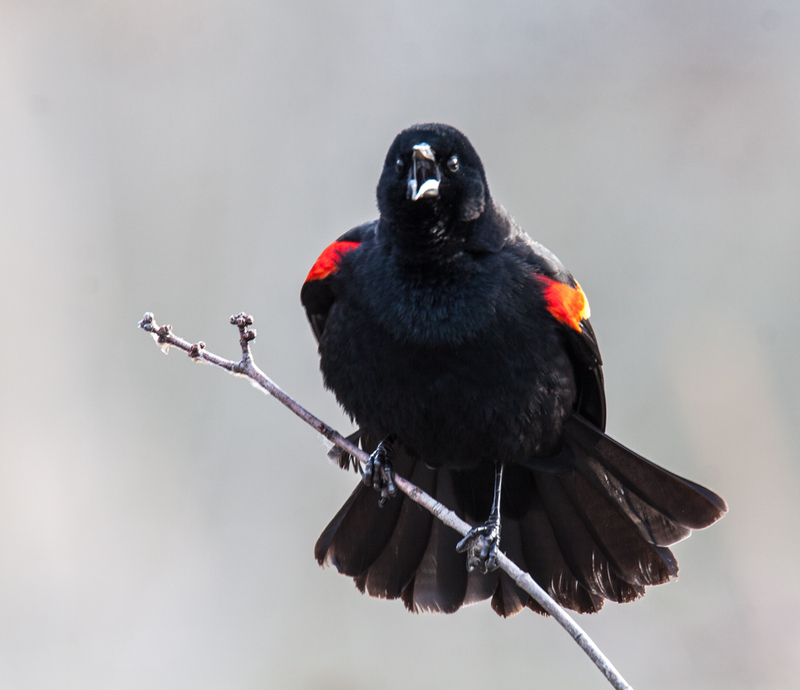 I’ve photographed Red-winged Blackbirds lots of times, but I rarely pass up an opportunity to shoot them again—I just never know when I may capture an unusual moment. The sun had risen and light was starting to reach the cattails. I turned toward the light when I heard a blackbird call out. 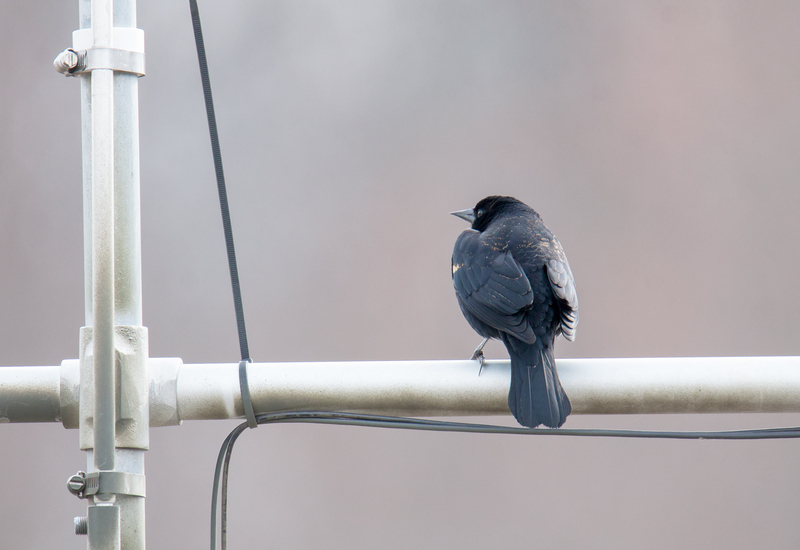 As I zoomed in on the bird, I was amazed to see that the blackbird’s breath was visible as he forcibly exhaled when singing. 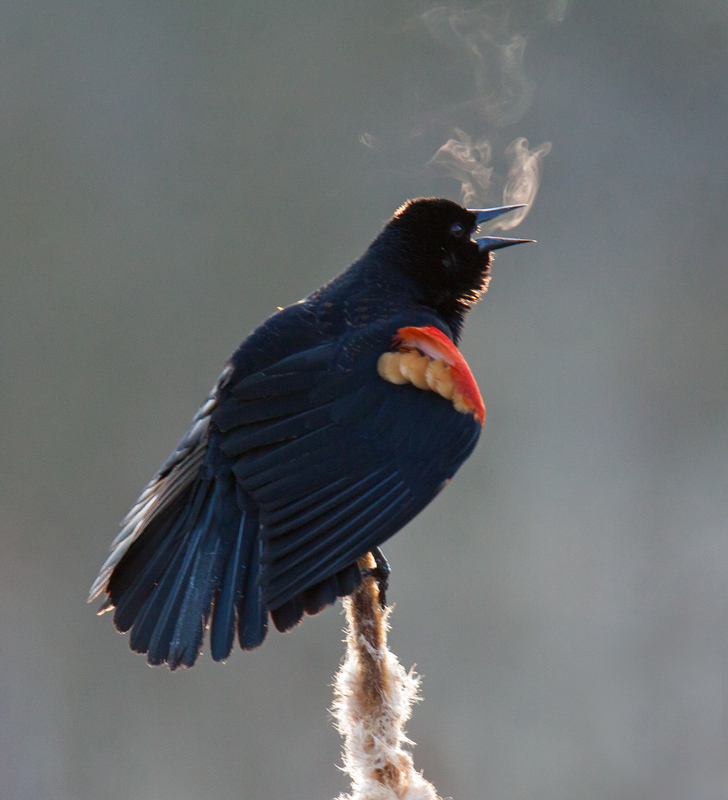 In the still morning air the visible breath swirled about and the bird looked like a smoker getting his early morning nicotine fix. I was fascinated by the differing patterns of the condensation as the blackbird moved his head or body position and was thrilled to be able to capture several different views of the blackbird’s visible song. As I went to bed last night, I noticed that the counter for my blog was right at a hundred thousand views. Thanks to so many of you for helping me to reach this milestone and for encouraging me and supporting me as I journey on into photography. Some days it seems like the birds are conspiring against me. They are so skittish that they fly away long before I am within range or they hide behind a wall of branches, where I can hear them but cannot see them clearly. 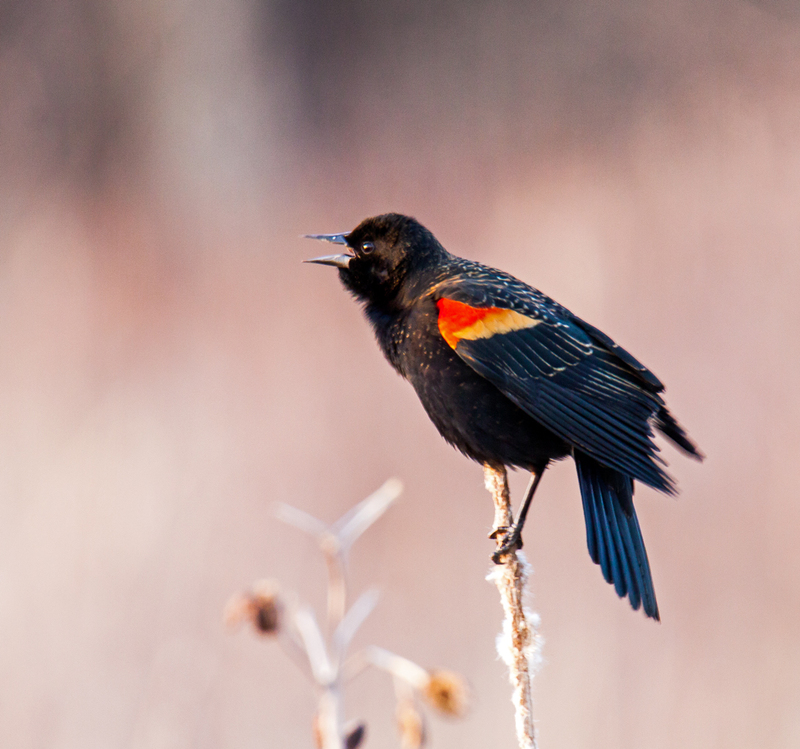 In moments like that, a male Red-winged Blackbird (Agelaius phoeniceus) often comes to rescue me from my despair. These birds are so bold and defiant that they refuse to hide. 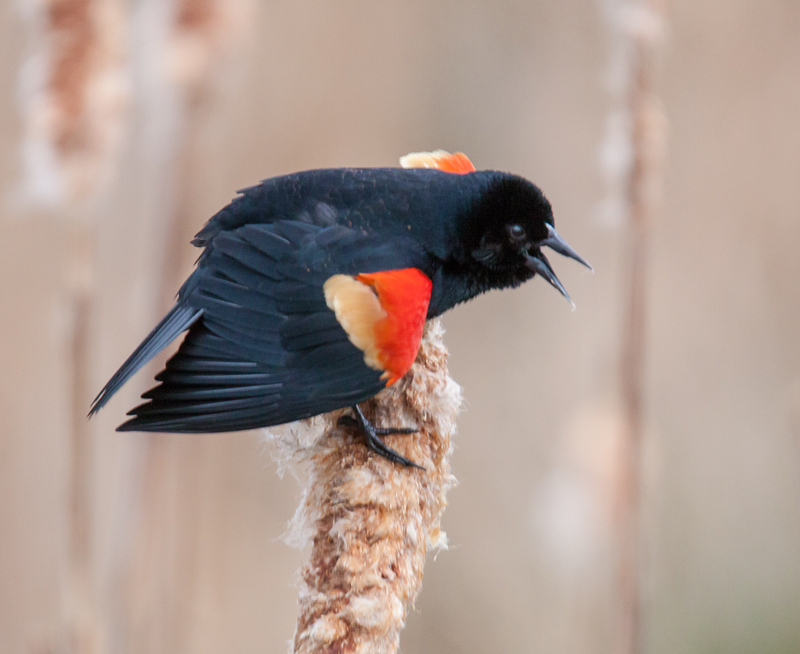 Instead, they find the most prominent perch and sing out as loudly as possible, showing off for rivals and potential mates.